Does paying salaries of agency staff make you the employer? Does paying the salaries of agency staff make you the employer? An interesting conundrum arose recently, when a marketer was approached by the CEO of their creative agency and informed that the account management lead on the account had been approached by a rival agency with a very generous employment offer. The marketer was a little shocked and asked the agency CEO what he intended to do to keep the account lead, as they were seen as a vital part of the client / agency relationship. Now here is where it gets interesting, as the CEO asked the client if they would increase the agency retainer so he could match or improve on the rival offer. So if you were the marketer, what would you do? It gets slightly more complicated, as in this particular case, when the agency was appointed to the business; the marketer had asked that this particular account lead was recruited from the previous agency as they had specialist category experience and detailed knowledge of the business. In fact to secure the staff member, the agency had to pay a premium for the role they were filling and this premium had been accommodated in the agency retainer at the time, so a precedent had been set. Another marketer had found themselves with a shortfall in their head count and a freeze on additional staff and so the agency had kindly offered to provide a number of staff as outsourced staff to the marketing department. The arrangement was made to include the staff as part of the agency retainer, including full overhead and profit mark ups (but that is a separate issue) on top of the agency employees’ actual salaries. Six months into the appointment, the agency informed the client that the agency was providing all staff members with an 8% salary increase across the board and that this would be added to the fee paid by the advertiser for these resources. In fact this continued on an annual basis and over a period of almost three years the staff received a 32% compounding salary increase. In the face of significant budget cuts, the advertiser wanted to undertake a review of the agency retainer. However, when the discussion with the agency turned to the outsourced marketing department staff, the agency refused to include them in the review stating that this was a separate arrangement outside of the agency contract and any changes would mean the withdrawal of those staff from the client. The marketer faced a conundrum as the agency staff, after almost three years, had become part of the department structure and had skills, expertise and experience that would prove difficult to replace. I heard from a marketer, that during a pitch he ran, the incumbent agency was clearly feeling that the chance to defend the business was looking slim. In desperation, the agency CEO called a meeting with the senior marketer and bought along three of the most senior agency account management team, all of whom had worked on the account for many years and all had become valued members of the agency team to the marketing team. The agency CEO sat down, opposite the marketer with the three senior account team members beside him. He explained that if the agency was unsuccessful in defending the account the loss of revenue would mean that he would need to let between 8 and 12 staff members go from the agency, depending on the seniority of those resources terminated. He explained that while it was difficult, he wanted to minimise the impact on the agency and believed that it was better to lose fewer senior, more experienced staff, than more of the more junior staff. He then proceeded to give a synopsis of each of the account management professionals with him, including reminders of their personal circumstances and the value they had added to the account as well as the times they had gone above and beyond expectations to deliver for the client. Finally he turned to the marketer and said that the decision was far too difficult for him to make and that if the marketer chose to terminate the relationship with the agency, he would like them to also choose which two of the three people sitting before them they thought it was best he terminate. After all it was this income that paid their salaries. As part of the agency agreement, there was a bonus component in the contract that was to be paid to the agency on an annual basis at the discretion of the CMO. Each year this modest bonus was paid to the agency without much discussion and was seen largely as a formality. But this year the client was facing difficult trading circumstances and budget cuts across the business, with financial incentives for departments that delivered significant savings. The CMO had spoken with the agency Managing Director about this, suggesting that as a sign of partnership and good faith, the agency bonus would be paid this year on the savings the agency could demonstrate. The Managing Director was a little perplexed and pointed out to the CMO that savings were outside of the agency’s control as the budgets were set by the marketing teams and the agency retainer was fixed annually in the contract. When the time came for the agency bonus discussion, the CMO explained there would be no bonus as there were no visible savings or even an attempt to deliver savings by the agency. The agency Managing Director again explained that savings were outside the control of the agency. About six weeks later the CMO was invited to attend the agency staff Christmas party and was surprised to see he appeared to be one of only a handful of clients at the party. The reason became apparent when the agency Managing Director stood up and announced to the staff in his speech that while the agency had had a good year and done some fine work, there were a number of unnamed clients who had felt that the agency did not deserve their annual bonus and therefore there would be no bonuses this year for staff. Beyond the legality or the morality exhibited in these examples, there is a fundamental issue regarding the relationship between the marketer and the agency. It is all too common to talk about the agency as partners, when in actual fact the contract defines the relationship as contractors or sub contractors. As the agency supplies resources the relationship can become a personal one, and the time spent working together in co-creation of ideas and campaigns means that close and personal friendships can build across this supplier relationship. But ultimately it is a commercial relationship and the agency is responsible for actually providing the resources with the skill sets and expertise to deliver the requirements of the marketer. This can become blurred in some cases, especially when the marketer begins to define how the agency manages their business. In these cases, the marketer can leave themselves open to being emotionally and morally manipulated, as seen in these examples. This is something that marketers should avoid, but often the ‘relationship’ can overshadow the fact that this is primarily a commercial arrangement. 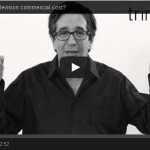 How much does a television commercial cost?